When you pop a piece of gum into your mouth, you’re more likely to be concerned with its taste and bubble capabilities than with its history. But if you were to wonder about the origins of your gum, you’d have a lot more to chew on. The story behind chewing gum is a flavorful one, complete with an unlikely partnership between a famous Mexican general and an American inventor, wild get-rich-quick schemes, and the mastication habits of a lost civilization. To trace the custom of chewing for pleasure to its source, we must look to the ancient Maya people of Central America. Originating in the Yucatan around 2600 B.C.E., they rose to prominence around 250 C.E. in the area now known as southern Mexico, Guatemala, western Honduras, El Salvador, and northern Belize. Building on the inherited inventions and ideas of earlier civilizations like the Olmec, the Maya developed astronomy, an intricate calendar, and hieroglyphic writing. The Maya were also noted for elaborate and highly decorated ceremonial architecture, including temple-pyramids, palaces, and observatories, all built without metal tools or use of the wheel. They were expert weavers and potters, and to hawk their wares they cleared routes through jungles and swamps, fostering extensive trade networks with distant peoples in the process. The Maya were equally skilled farmers, clearing large sections of tropical rain forest to plant food crops like corn, beans, and squash, as well as hemp, cotton and sapodilla trees. The Maya boiled the sap of the sapodilla tree to a sticky mass, a substance we today know as chicle. For the Maya, its uses were many. They used it in making blowguns and as a strong glue in crafts and architecture. It was an article of trade and was frequently used in religious rituals. Maya boys chewed it, calling the stuff cha. The Maya abandoned their cities for mysterious reasons around the year 800 C.E., but fortunately for us, they retained their custom of chewing chicle. Flash forward a few hundreds of years, because 1869 marks the year that modern day gum products were born. The famous Mexican General, Antonio Lopez de Santa Anna (remember the Alamo?) was looking for a way to commercially exploit the properties of chicle. Unaware of its chewable virtues, Santa Anna originally hoped chicle could be exported as a rubber substitute. So he passed it along to American inventor Thomas Adams. Adams found chicle unsuitable as a base for rubber, but realized its potential as a chewing gum after boiling it and rolling it in sugar. His boiled chicle vastly outsold all other varieties of gum available at the time, and thus revolutionized the industry. Though Adams can be credited with the invention of chicle-based chewing gum, it was William Wrigley who built an empire on it. By 1893 Wrigley contracted the Zeno Gum Corporation to make the two main brands still available today – Wrigley’s ‘Juicy Fruit’ and ‘Spearmint.’ His marketing of these products was remarkably innovative and defiant of convention: a mile-long sign composed of one hundred and seventeen billboards between Atlantic City and Trenton, New Jersey, a huge collection of placards and electric signs in Times Square, and a campaign of free samples for millions of storekeepers and salesmen. The campaign was a resounding success, and the chewing of gum became a national addiction. The increasing consumption of chewing gum in the United States meant an increasing demand for chicle from the Peten. Chicleros, or Sapodilla tree-tappers, began to immigrate into the region from neighboring zones such as Veracruz, Chiapas, Yucatan state and Belize. These workers in the forest economy began to enjoy greater economic freedom from the oppressive Mexican state and the Yucateca elite. Whole villages came to rely on the production of chicle; the village of Uaxactun, for example, arose around an airstrip that was visited daily by small aircraft from the Wrigley’s company, collecting chicle for export to the Unite States. In 1943, México exported 8,165 tons of chicle to the United States, the largest amount in the industry’s history. However, this boom was short lived; during World War Two, the shortage of chewing gum base forced manufacturers to develop synthetic gum resins, which gradually replaced chicle as a gum base. The market for chewing gum has grown remarkably through the years, from a yearly consumption in the United States of 39 sticks per person in 1914 to 200 sticks per person today. Gum made from synthetic materials makes up the majority of this expanding industry. However, chicle is still being harvested today in Guatemala, Belize and Mexico for use in high quality gums in Asia. From September to January, a time of torrential rains in the Peten, skilled laborers called chicleros hike out to remote parts of the rainforest, seeking either virgin Sapodilla trees or those that were tapped many years prior. They climb up the long trunk of the tree and make a series of diagonal cuts with their machete, taking care to cut only deep enough to allow the white sap to bleed out, but not deep enough to expose the tree to insects or infection. The sap runs down the tree in the grooves cut out by the machete, and collects at the base of the tree in a small canvas sack left by the chiclero. At the end of the day, chicleros collect these sacks. Each tapping only yields about 2.5 pounds of liquid over a six-hour period, and a chiclero will tap 6-12 trees a day in order to make his quota. The key ingredient to Glee Gum is chicle. 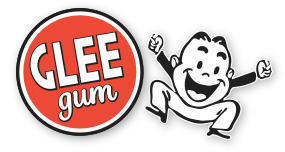 Glee Gum is actually one of the only gums in the United States made with chicle. Using chicle helps protect the rainforest and provide sustainable subsistence for the people that live there. Without non-timber forest products like chicle, the trees in the forest would be cut down systematically, as their only commercial value would be as logs. So consider that the next time you choose your chewing gum, and chew-se wisely! Wanna See the Process from Tree to Glee?